The invention of the movable-type printing press, customarily attributed to Johannes Gutenberg (c. 1400-1468), was undoubtedly an event of great significance to the subsequent intellectual and cultural development of European life. Astronomy, as a field of study, was not exempt from the effects of the new technology's adoption. Many ancient and medieval astronomical texts were issued in print before the close of the fifteenth century, and an increasing number of new works were published via the presses. Several astronomers, including Regiomontanus, Johannes Schöner, and Tycho Brahe, engaged with the printing process by managing their own presses; a greater number were, like Johannes Kepler, involved at some level in overseeing the printing of their own and others' works. The presses also provided a new method for manufacturing instruments; and in the sixteenth century there was a lasting expansion in the production of celestial maps and globes, printed first from woodcuts, and then from copper-plate engravings. The tremendous success of the technology of print has led some historians to speak of the "triumph of the book" in the sixteenth century. The extent to which manuscript culture persisted and co-existed with the use of print should not be underestimated however. Books produced before 1500, that is Incunabula (Latin for swaddling-clothes), strongly resemble manuscripts, with pages dense with text which contains numerous abbreviations and ligatures and is broken into short chapters and sections. Some books were printed on vellum, and some illuminated in the same manner as manuscripts. Short texts were, throughout the early-modern period, often bound in one volume with others with which they might or might not have some close relation. Only gradually did printed books acquire distinctive features and apparatus: even after the introduction of title-pages, for example, which listed the author, title, and producer of the book, a colophon was commonplace. 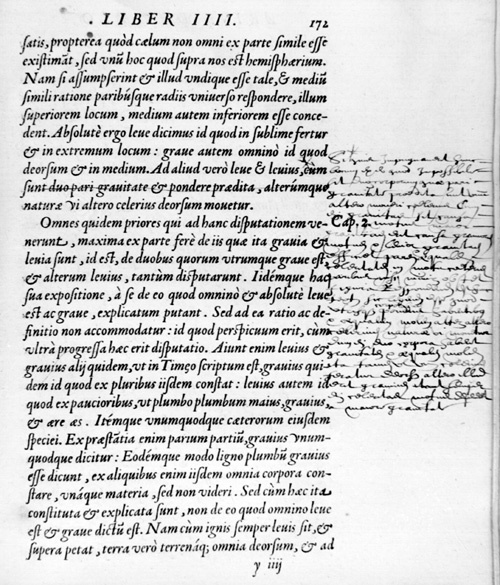 Foliation (numbering by leaves) and pagination, intermittently employed in late-medieval manuscripts, were both utilised for early-modern books, often with numerous errors; catchwords, linking the text at the bottom of one page with the start of the next, and signatures, distinguishing the printed-sheets which constituted two or more pages of the book, depending upon format, were important in the printing and binding phases of production. Contents pages, indices, and lists of errata were supplied in some early-modern books; but they were often supplemented or compiled, when otherwise absent, by readers themselves. 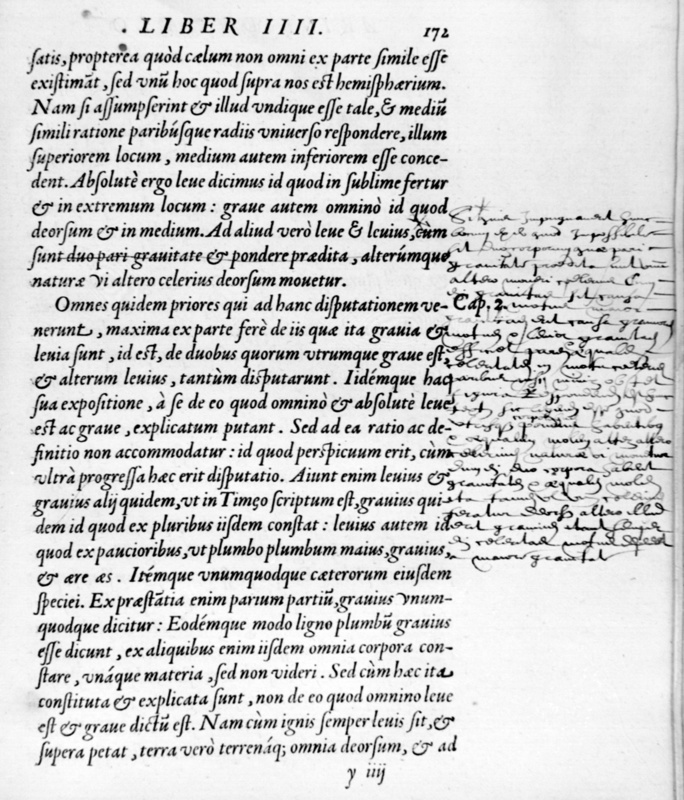 An annotated page in a sixteenth century edition of Aristotle. Early-modern readers often annotated, underlined, and otherwise marked their books. Binding of texts often followed rather than preceded their purchase, and one strategy employed was the interleaving of a printed work with blank pages on which notes could be written. Such additions to a text might themselves be printed, for example if they were made preparatory to the production of a new edition of a work. They might also be transferred into successive copies of a work, as demonstrated by a famous instance involving Copernicus De Revolutionibus. Certain types of writing, such as letters and lecture notes, frequently circulated widely in manuscript irrespective of whether or not they eventually came to be printed - although many did. Printed works themselves might be copied out as manuscripts, whether for aesthetic reasons, or for the benefit of someone who could not obtain a printed copy. The production and distribution of printed texts was affected as much by commercial interests as scholarly needs and aspirations. Certain printing houses, such as those of Erwin Ratdolt in Venice, and Johannes Petreius in Nuremberg, took a particular interest in the production of mathematical and scientific works. But profit was not always served by producing books to the highest standards, or texts which were of interest to a minority of specialists. Publishers who printed standard university text-books, such as treatises on the celestial sphere and Theoricae planetarum, were assured a fairly steady income; the best-selling new works were calendars and almanacs rather than texts of great theoretical significance. Individuals who did undertake the publication of new texts in astronomy and mathematics, for example Tycho Brahe and the French publisher Guillaume Cavellat, were quick to point out the great expense they incurred as a consequence of furnishing the reader with the diagrams necessary for their understanding. The publication of astronomical tables presented further printing problems, since each page required a large number of numerical characters, more than would typically be required for other kinds of work, and demanded particular care during composition and proof-reading if errors were not to be admitted. Rarely paid for supplying a printer with copy, early-modern authors might instead be forced to underwrite the costs of publishing their work, or obliged to purchase a certain number of the printed edition. In addition to the commercial mechanisms of distribution, authors and publishers frequently used their books as gifts, partly so as to recognise or solicit financing and patronage, partly so as to establish and maintain cordial relations with other scholars. Presentation copies of books were often enhanced with a special binding or by colouring of any illustrations; dedications, which might be printed in the book or added in manuscript, were widely employed as another way of making a present of a work. Production of an edition of a text required a substantial investment: in addition to the purchase of a press and type, both of which could be re-used, each work demanded additional expenditure on paper (a major component), ink, illustrative engravings (re-cycled whenever possible, sometimes within a single text), and labour. For all but the fastest-selling works, this investment was only recouped slowly. Consequently, publishers were anxious to protect their investment by ensuring that their editions were not superseded or challenged by versions of the same text. A partial protection against competition and piracy (the reproduction of a work through the unauthorised copying of the text and, quite frequently, the layout, diagrams and apparatus of an existing work) was provided by a privilege: a document, issued by some city or regional authority, which granted a monopoly in the production of a particular text. Usually valid for a few years, privileges typically indicated a fixed penalty (fines and confiscations) for their infringement, but the onus was on the injured party to pursue transgressors via the law courts; there was no redress for piracy enacted outside the jurisdiction of the issuing authority. Sometimes the text of a privilege was printed within a book as a warning to would-be pirates; more commonly, just the fact that a privilege had been granted was prominently displayed. 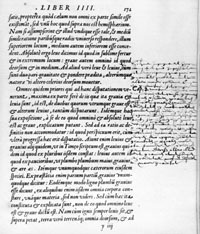 A copy of a commentary on Sacrobosco in which Melanchthon's name has been erased. In many places, the process of acquiring a privilege was coupled to the licensing of a text; the passing of a work as acceptable for public distribution by the criteria of the appropriate ecclesiastical or secular authority. Via customs inspections and examination of a bookseller's stocks, control could also be exercised over books imported from elsewhere. 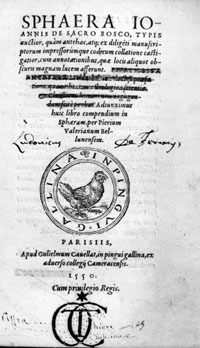 The moral and political content of texts was of particular concern as a consequence of the confessional and civil strife attending the religious reform movements; the Catholic Church's Index of Prohibited Books, dating from the middle of the sixteenth century, is only the most famous example of organised censorship attempted in the early-modern period. Sometimes works were passed for publication subject to their alteration, and, in the case of works already printed, this might be done by a variety of methods which physically altered the text: inking-over printed text, excising pages or parts of pages, or pasting over censured passages with blank paper or paper carrying a corrected text in print or manuscript. The treatment of copies Copernicus' De Revolutionibus following the Catholic Church's condemnation of heliocentrism as a philosophical doctrine constitutes an important example of the application of such practices to an astronomical work. The pasting-over of paper slips, however, was also used for the correction of errata within print-shops, and for the emendation of maps and globes by both publishers and owners. Astronomers used and authored astrological tracts, astronomical tables and ephemerides, calendars and weather diaries, cosmographies, defences and histories of their discipline, instrument-treatises, observations of celestial phenomena, studies on optics, theories of planetary motion, and works on geometry and trigonometry. Particular events, for example the comet of 1577 and the Gregorian reform of the calendar, prompted a large number of publications. Astronomers also made use of texts and commentaries in fields related to their own, namely natural philosophy, alchemy , and medicine, as well as scripture and, as a source of bon mots, poetic inspiration and stylistic direction, classical literature and works of rhetoric. Acquisition of texts proceeded partly through commercial routes: individual book-sellers obviously played a role, but the great trade fairs (such as the biannual book-fair at Frankfurt-am-Main), and the catalogues which issued from them, were important to the wider distribution of new books and information about them. There was also a healthy market in second-hand books and libraries. Individuals like Tycho Brahe and Johannes Kepler, both relatively isolated before their respective moves to Prague, depended heavily upon sympathetic correspondents for news of texts, and their purchase or loan. 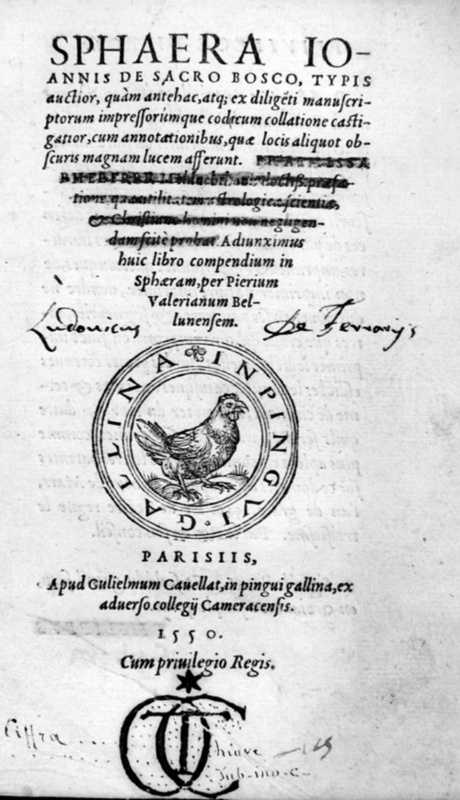 Sometimes individual books made a very important contribution to an astronomer's own works: Copernicus, for example, recast some of his De Revolutionibus after receiving a copy of Regiomontanus' De triangulis as a present from the mathematician Georg Rheticus. 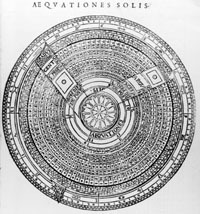 A volvelle from a sixteenth century text. An important category of early-modern astronomical work is the instrument-book: a treatise explaining the construction and/or use of a particular instrument or class of instruments. Such texts were written on familiar devices such as armillary spheres, astrolabes, sun-dials, quadrants, and globes, as well as to describe and advertise instruments newly invented by the author. Treatises on globes were often produced as manuals to accompany a specific instrument or pair of instruments. In addition, some printed books supplied paper instruments, either in the form of illustrations of devices which could be cut-out and pasted onto wood for use, or mobile parts and volvelles within the volume itself. 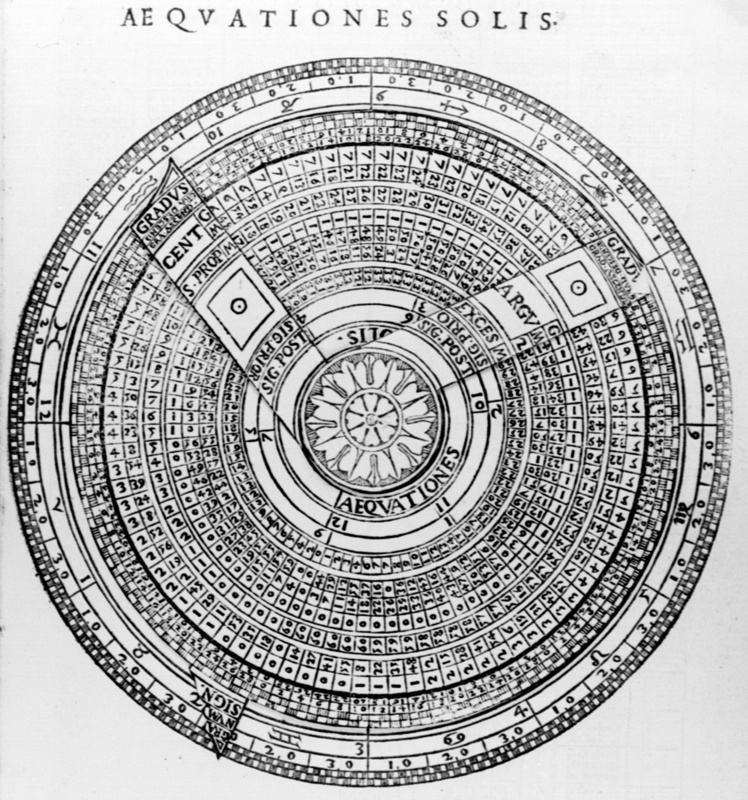 The Astronomicum Caesareum (1540) of Peter Apian is the most famous of the books which contained astronomical volvelles, but there are numerous other examples which date from the early-modern era. It should be noted, however, that volvelles were another legacy of the manuscript age.